There is a brief text recap at the start of this book as we are joining the action mid-fray. Even then you will probably want to go back and re-read the last one. Dialogue. That’s the name of the game here. It is great, snappy, realistic dialogue, but it would be more suited to a movie or a radio play. The endless string of, admittedly clever, speech bubble spaghetti tramples all over the wonderful visuals. This is a slow and dense read to start with lots of talking heads and linear interviews. You could easy spread this book out to twice its length – but well done to Bendis for not doing so. By getting the words out of the way early on the art gets a chance to breathe and flex its muscles when it counts – the art, which is in fact, superb. 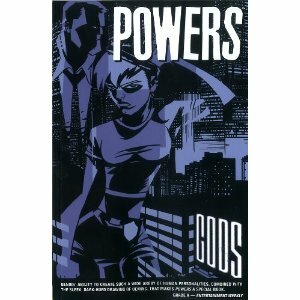 Oeming uses so few lines and so little fine detail that his work is almost impressionistic. The inking and colouring does such an amazing job of bringing these characters and locations to life. This is a very dark book, set mostly at night or indoors. This allows Oeming to show off his wonderful understanding of light and shadow making it beautiful to look at. Even the lettering works so much harder than in other titles. Although part police procedural, part superhero action-fest, we do get to explore some big themes here. Whilst not quite Alan Moore territory Bendis does raise good questions about his subject matter and gives you all the poking you need to think on some weighty issues. It has been an awkward transition from the much loved previous Powers era to this new direction but this book is the equal of many you have read before. A POWERful Thumbs Up!